OK. So, the emulator does not yet support network multiplayer games, and the the four-player mayhem for which the N64 was famed is missing, but the sheer retro joy of N64 gaming is unsurpassed - if you don’t mind playing on a 4” screen rather than your 50” plasma. While emulators that run SNES, GBA, GBC, Sega Gamegear and Megadrive games have been available in the Market for a while, the Xperia Play already has a Playstation style pad built in, which makes games more intuitive to play. 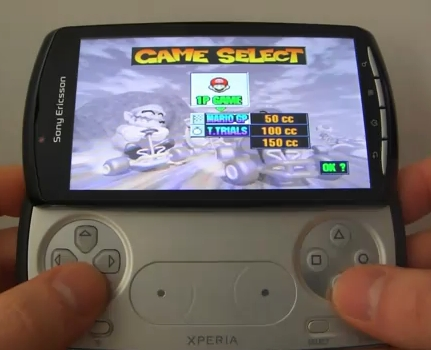 The Xperia Play was supposed to be released in the UK on March 28th but got delayed by O2 due to some late-stage bugs. In the US, release is rumored to be early April, with the first official game as Crash Bandicoot. The device boasts a 1 GHz Snapdragon processor, 512MB RAM, 400MB ROM, a 4" 854x480px touchscreen, a 5MP camera, and Android 2.3. Early reports indicate a moderate amount of lag in video sequences, but when playing, olde stylee games run beautifully - very smooth, very responsive, and with N64oid, certainly the closest you will get to playing genuine Nintendo games on any phone platform in the near future. Games for N64oid can be added via standard N64 ROM images, which if you’re an enthusiast, you’ll already have and if you’re not, you can borrow from your friends.